Hug a Tree : Why trees are amazing. Whenever I’m in the outdoors, I love to Hug a Tree. Sometimes the people that I’m hiking or camping with think that I’m crazy (and maybe you do too), but it doesn’t really matter, I know the trees appreciate it! I’ve seen some pretty incredible trees that are absolutely gigantic. Hugging makes me realize how small and inconsequential I am in their long life. Trees do not die because they get old. They are usually killed by bugs, or disease or logging. They are the longest living organism on earth. Prairie creek Redwoods State park in California is where the oldest tree on earth lives. They believe it is 7-12 Thousand years old, and even has a name: Eternal God! Sequoia’s live 4 to 5 thousand years! However, the average lifespan of a tree living in the city is only 8 years. Trees can communicate: Willow trees will produce more tannin (a bitter substance) if another tree is being affected by webworms and caterpillars. Do not hug the Manchineel tree (found in the Caribbean and Central America) as it’s bark causes blisters if touched. The term “Knock on wood” came from ancient tree worship, when they believed that this would beckon good spirits from the trees. 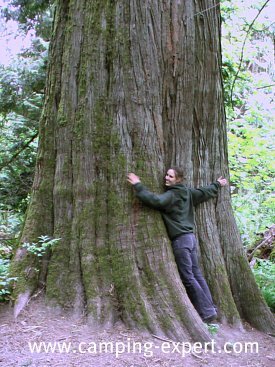 Some of the most incredible trees that I’ve hugged are on the west coast of Canada, on Vancouver Island at the nearby parks. I would love to visit more amazing trees of the world. Two mature trees can provide enough oxygen for four people for a year. Maybe this is why we feel alive when we’re in the woods. Have you Hugged an Amazing Tree? Share your fantastic tree hugging experience, be it a giant, ancient, or just plain your special tree! Share your story! Do you have some pictures or graphics to add of you with the tree? Great! Click the button and find the first one on your computer. Select it and click on the button to choose it.